$10 Gift Card for all new Medical, Dental, or Behavioral Health customers who become our new patients at one of CSC Health Clinic in 2019! Our Health Clinics have several locations from Chinatown, Los Angeles to San Gabriel, Alhambra and Monterey Park. For appointments or inquires, please call us at (213) 808-1790 or (213) 808-1792. Chinatown Service Center (CSC) hosted the annual summer community health fair on the morning of July 14, 2018 in the heart of Chinatown. Over 300 community members visited CSC, where they received health information and resources in an informative, educational, and enjoyable setting. Twenty-four of our community partners from the city, county, nonprofit, and for-profit sector collaborated with CSC to provide information and resources to the community regarding healthy living and local low-cost or free programs for the aging, low-income families, and children. CSC also collaborated with volunteer health screening teams from Asian Pacific Health Corp, National Research Institute (NRI), to provide free body mass measurements, hypertension, glucose, hearing, and vision to the public – empowering community members to gain knowledge and take control of their health. Our sponsors, 211 Los Angeles County, ABBVIE, Allied Pacific IPA, California Telephone Access Program, Care 1st, Center for Health Care Rights, Comfort Keepers, Gilead, Forest Lawn, HealthNet, L.A. County Lead Poisoning Prevention Program, and Rose Hills, who not only provided invaluable resources but also provided product giveaway, allowed us to reach more community members in need of health care and allowed us to educate them about their health needs and community resources. Our product sponsors, Starbucks, Noosa, JSL Foods, Inc., and AFC Trading and Wholesale Inc., who generously donated well over $3,000 worth of product, exposed the public to tasty and healthy snacks that could be found in local grocery stores throughout the community. Expert speakers from USC Keck Medical Center and Alzheimer’s Greater Los Angeles engaged the community with critical health education workshops about how to keep the lungs healthy and the brain active and strong through prevention, nutrition and fitness. It is CSC’s greatest pleasure to know that we are able to meet our community needs and reach people in need of heath care – especially the underinsured and uninsured – enabling them to learn that health care is assessable and unintimidating and open for all classes of people. SB 75 is a new law in California that gives full scope Medi-Cal to children under the age of 19 regardless of their immigration status who met the eligibility requirements for Medi-Cal. Medi-Cal provides children with free or low-cost preventive medical care and treatments including vision, dental and mental health. It also covers alcohol and drug use treatment, drugs your doctor orders, and more. It is anticipated that SB 75 will be implemented on May 1st, 2016 and Department of Health Care Services (DHCS) indicates that the state systems will be ready to enroll children into full scope medical beginning May 16, 2016. All children with restricted-scope Medi-Cal (also known as “emergency Medi-Cal”) will automatically transition to full scope Medi-Cal without having to fill out a new application. 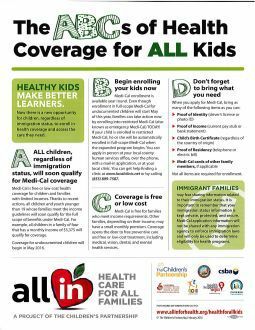 In order for children to qualify for full scope Medi-Cal, the family income must be at or below 266% federal poverty level. For instance for a family of 4, they must earn $5,387 per month or less, family of five $6,305 per month or less and family of six $7,222 per month or less. When I first met my future wife in Guangzhou it broke my heart to see her living in poverty. I wanted to bring her to America and give her a good life First stop? Where else? Chinatown! She made some new friends and they told her about what would become one of my greatest blessings, the Chinatown Service Center. The office staff were really nice and the doctors were compassionate and thorough. But the dental technicians, most of which looked as if they were just fresh out of med school were the best. You could tell that they were really putting their heart into it and the level of skill they demonstrated was impressive. When my wife was in pain and needed medical attention they were a life saver It was so helpful that they spoke English while my wife could discuss her condition with them in either Mandarin or Cantonese. And now thanks to Dr Aguilar we can also hablar espaniol! Muy bueno! Recently I got bronchitis, needed hernia surgery and a root canal. Luckily not all in one day, but thanks to everyone at the Chinatown Service Center today we are now both happy and healthy and my teeth are in pretty good shape too which is nice because I bet dinner is going to be good tonight! So on behalf of my wife and myself I would like to say to everyone who has so kindly contributed to the Chinatown Service Center; xie xie, dou jai, thank you and gracias mi amigos!